“We thought the walking would be limited by the duration of the battery outdoors,” Grizzle says. “It turns out it doesn’t seem that that was the case.” Cassie managed a total of an hour and a half of operation out in the cold, with battery power to spare. Why it fared so well, Grizzle isn’t sure. “We couldn’t quite tell because the power shut down and the robot just fell to the ground,” says Grizzle. 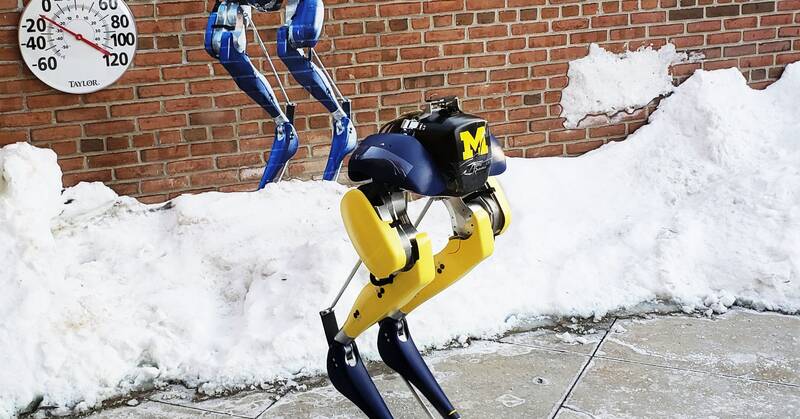 “So we took Cassie back into the lab and took some caps apart and reconnected the wires.” No fall for a robot worth hundreds of thousands of dollars is a good fall, but the weather only made matters worse here. “She cracked the protective cover on the battery because the plastic became brittle at this temperature, so it shattered almost like glass. So we kind of taped it back together.” Good as almost new, Cassie went back out and walked for another hour straight.